It's no secret that I'm the world's healthiest eater. I love everything that's terrible for you — excessive amounts of sugar, butter, animal fat... if it's guaranteed to give you heartburn, I probably love it. I was even worse in high school. I thrived off the grossest things. Not only did I eat a lot of fast food, I ate a lot of terrible, super-processed and frozen junk foods. Pepperoni Hot Pockets? One of my favorite foods for the longest time. Bagel Bites? Yes please. Okay, but truth be told, my first batch of strawberry milkshake cupcakes were... well, too sweet. Almost frighteningly so. Indeed, as I was going through and measuring out the ingredients, it seemed like the recipe was using a shocking amount of strawberry milkshake powder. Bear in mind that the Hummingbird Bakery is a British bakery, so I suspect that strawberry milkshake powder in England is probably significantly less sweet than it is over here since British people tend to be more health-conscious (I don't know if that's actually true, but I do know that Hot Pockets and Bagel Bites don't exist in England, so there's that). When I gave a cupcake to my coworker with a warning that they were too intense, she took a bite and frowned: "These taste exactly like this kid I used to babysit for's after-school snack. You know, Nesquik Strawberry Milk? These taste exactly like them." I responded by explaining what I told you guys above: yep, I was a fan and I used to drink that stuff by the bottle and I didn't recall them being incredibly sweet. She looked at me wide-eyed. "You're a fan? When was the last time you drank some of that stuff?" she asked. I admitted it had been years and years. She shook her head. "You need to try it again." Following her advice, I went to the local supermarket and bought a bottle during my lunchbreak. My first sip, I nearly coughed it up. The strawberry milk I remembered from my childhood wasn't this intense and sickly sweet... or was it? It certainly looked the same — the bright pink, the yellow packaging. Had my palette altered so drastically that my favorite childhood foods seemed incredibly artificial, overly sweet, and... well, just kind of sad? Probably. The truth is, we grow out of most of our favorite foods from our childhood. There's a reason I don't eat Hot Pockets anymore. 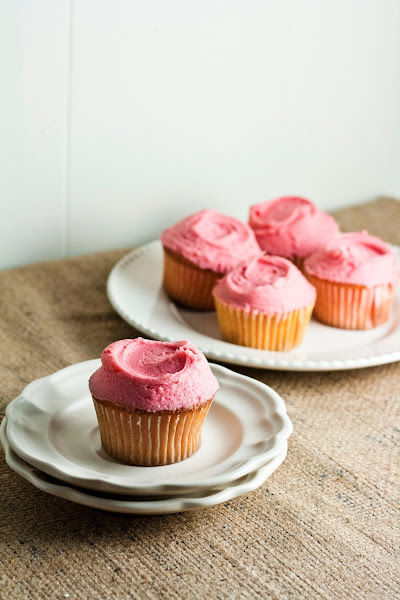 The result was a cupcake that was less sweet and had more strawberry flavor, complemented by a slight malty texture from the strawberry powder in the frosting. Don't get me wrong — it was still as sweet and decadent as a milkshake, just more... manageable. To top it off, I used enough strawberry milk powder to give the cupcake that bright pink color with no additional food coloring necessary. In the picture above, you can see that, not only is the frosting that beautiful pink, the cake is too. How pro is that? 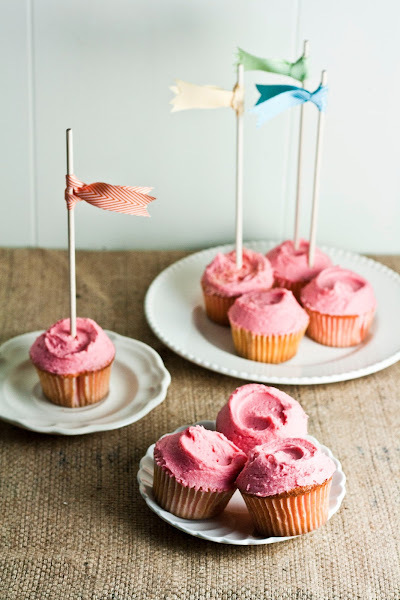 See the adorable cake flags in the cupcakes? They're courtesy of one of my favorite Etsy stores, Paper and Pinafore. Not only do they sell the adorable cake topper flags you see in the pictures, but they also offer gorgeous stationary, wedding invitations, and other cute paraphernalia. As a matter of fact, I'm currently coveting their colored baker twine and chevron striped ribbons to use as props in my food photography. Preheat the oven to 325 (F) and prepare your muffin tin by lining with paper muffin cases. In a freestanding electric mixer with a paddle attachment (or, use a handheld whisk), mix together 5 tablespoons unsalted butter, 1 3/4 cups flour, 1 1/3 cups granulated sugar, 1 tablespoon baking powder and 1/2 teaspoon salt until they form a crumb-like, sandy consistency. In a liquid measuring bowl, whisk together 3/4 cup whole milk, 2 eggs, and 1/4 cup strawberry milk powder. Turn your mixer to its slowest speed, and gradually pour half of the liquid mixture (from the third step) into the butter/flour/sugar mixture (from the second step) and mix until just combined. Turn off the mixer and scrape down the sides of the bowl. Once the batter from the sides of the bowl have been incorporated, turn the mixer back on to its slowest speed and gradually pour in the remaining liquid, continuing to mix until just combined. 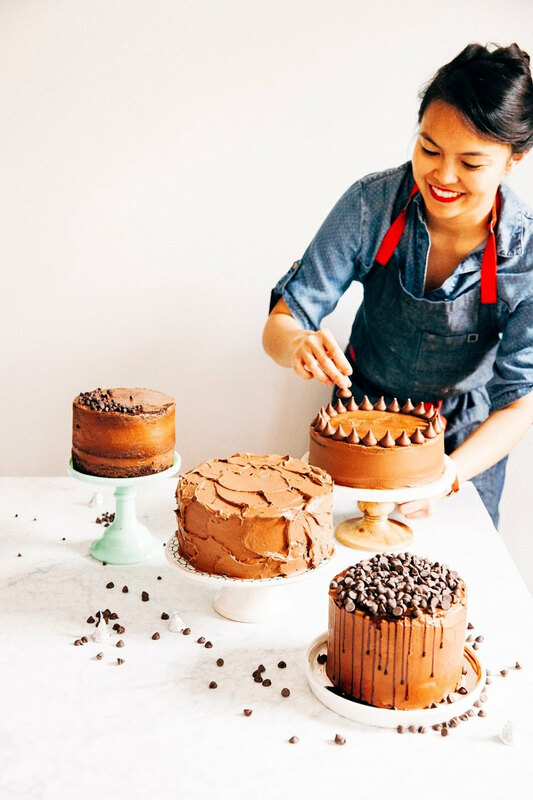 Use a rubber spatula to give the batter a few more mixes by hand to ensure that the batter is smooth and combined. 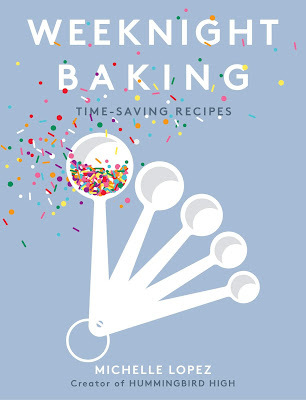 Use a 1 tablespoon-sized cookie scoop to spoon 2 tablespoons of batter into the prepared cases (or, if you don't have a cookie scoop, fill the cases up to 2/3rd full) and bake for 20 - 25 minutes in the preheated oven or until the sponge bounces back when lightly touched. Allow the cakes to cool slightly on a cooling rack, before turning out on to the rack to cool completely. Using a freestanding electric mixer with a paddle attachment (or, a handheld whisk), gradually beat together 3 3/4 cups confectioner's sugar with 11 tablespoons butter on a low speed until combined and there are no lumps of butter. In a small liquid measuring bowl, whisk together 4 tablespoons whole milk and 1/3 cup strawberry milk powder. Gradually pour the milk mixture (from the second step) into the sugar and butter mixture (from the first step) and mix on a low speed until the liquid mixture has been combined into the sugar and butter. Then, turn up the mixer and beat the mixture for 5 minutes, until the frosting is light and fluffy. Do not overbeat, or the mixture will be too liquidy and runny! 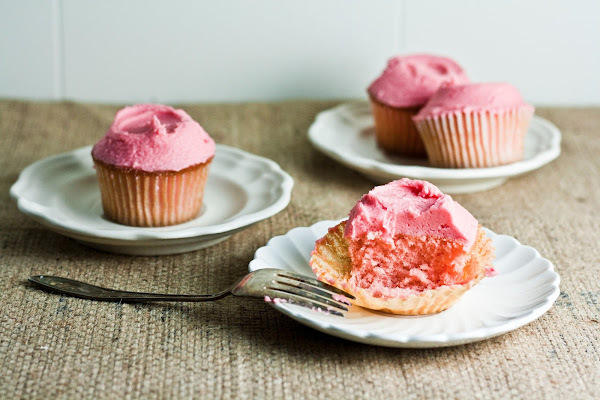 Use a 1 tablespoon-sized cookie scoop to spoon 2 tablespoons of frosting on each cupcake. Make sure the cupcakes are completely cool before you start frosting — otherwise they'll be soggy and I'll cry for you. Gorgeous photos and styling. You're right that the pink color came through beautifully, very pro! Yum, can't wait to try this recipe! Thanks so much for featuring my flags- the photos are beautiful! I love all of the local awesomeness here in Portland! Those cupcakes look amazing--thank you for sharing! Lol I love your commentary. No hot pockets in England?! (I never actually ate them as a kid, though I was always jealous of the kids that did). Um, I honestly don't even like strawberry flavored baked goods that much but I am so down with these! They look luscious! Wow, thank you for the trip down memory lane. I had note thought of Nesquick Strawberry Milk in ages, and remember making my mom buy it for me. 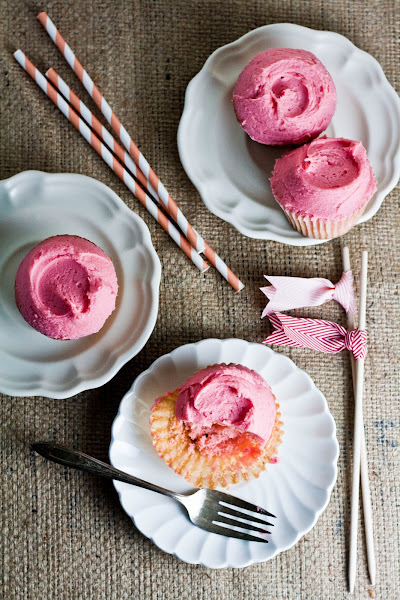 The pink icing on these cupcakes is just to die! We're celebrating our childhood favorites on the Shine Supper Club this month, and this would make a lovely contribution. Hope you'll join us! 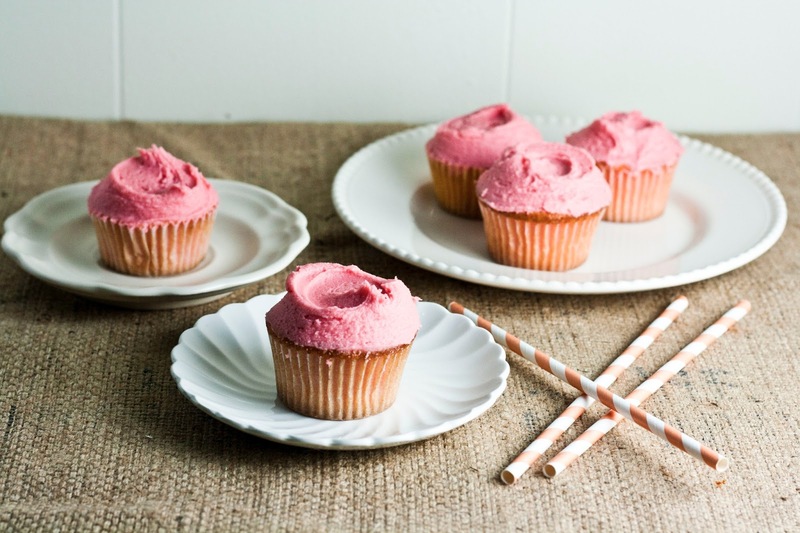 Milkshake cupcakes are best to serve on the special occasions like wedding or birthday. It is the utmost desire of everyone to make their occasions memorable. 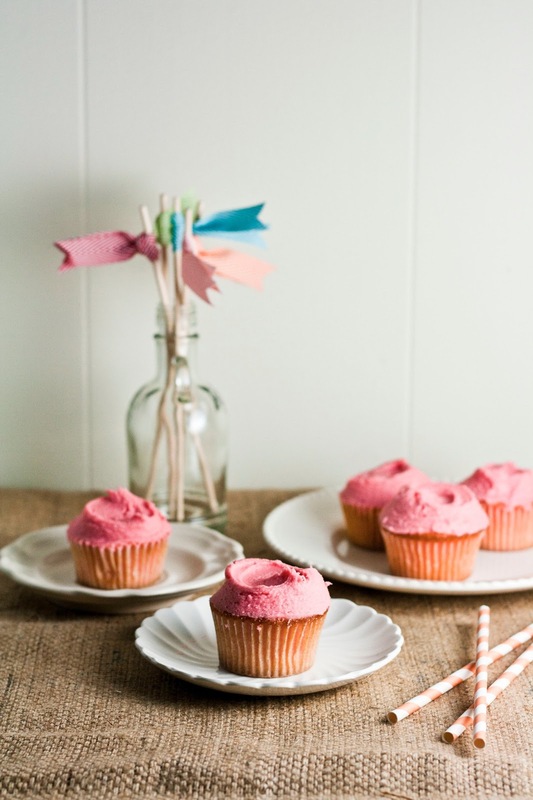 I like your ideas about making strawberry milkshake cupcakes for special occasions. Now you can visit http://birthdayplanet.net/treats/show/264-take-pleasure-with-vanilla-malted-milkshake to get vanilla milkshake recipes. Does anyone know if this would work replacing the strawberry milkshake powder with freeze dried raspberry powder? Would love to try but am not a fan of Nesquik! I would try mixing the raspberry powder with a glass of milk first to see if it makes something drinkable and akin to milkshake. If it tastes good, you might be able to pull it off! Let me know what happens. Oh dear, these did not turn out for me.... they never rose in the oven, but spread and spilled over onto the oven floor, came out hard and dry. Baking powder is mentioned twice in the instructions.... could baking soda possibly be missing? I wonder what I did wrong..
Oh no! Thanks for pointingo ut that typo — 1 teaspoon of baking soda is actually supposed tobe 1/2 teaspoon salt. If you used 1 tablespoon + teaspoon baking powder, it's likely you used to much leavening which caused the spilling out onto the floor. So sorry about that. The correct measurement is just 1 tablespoon of baking powder, and I've amended it in the recipe above.